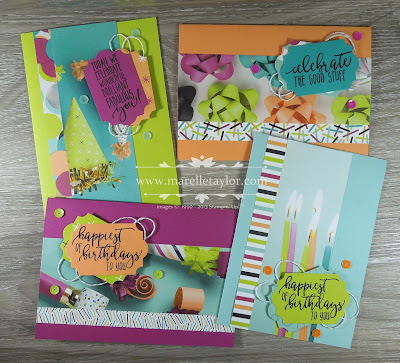 How much fun is the Picture Perfect Party Paper Stack? It does all the hard work on these cards. I simply cut it into 2 inch strips and used two of them on each card. Then, simply add a co-ordinating card base, some punched sentiments (from the co-ordinating stamp set, of course!) and a couple of decorative elements. I used Silver Baker's Twine and Tutti-Frutti sequins.